I do not like raisins. Ok, I kind of like them if they are covered in chocolate or sometimes if they are golden. My sister despises them so much that she tells people she is allergic, which I guess is true of anything you dislike so much it makes you sick. Maybe this is why my favorite cookie became oatmeal chocolate chip. My mom made them often from the recipe on the Quaker box. She used a lot more cinnamon and would keep a supply in the freezer. 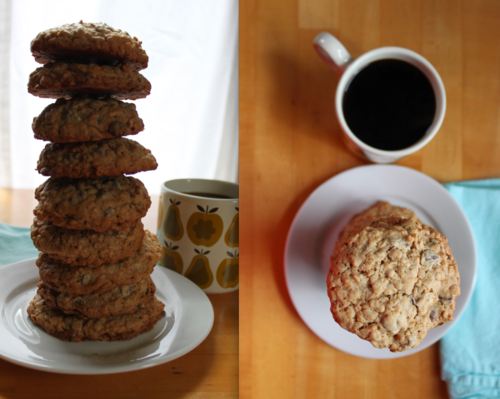 Whole wheat has been coming up a lot in cookie recipes around the web and I, for one, am really glad. It is an easy way to get more nutrition while getting your delicious too. 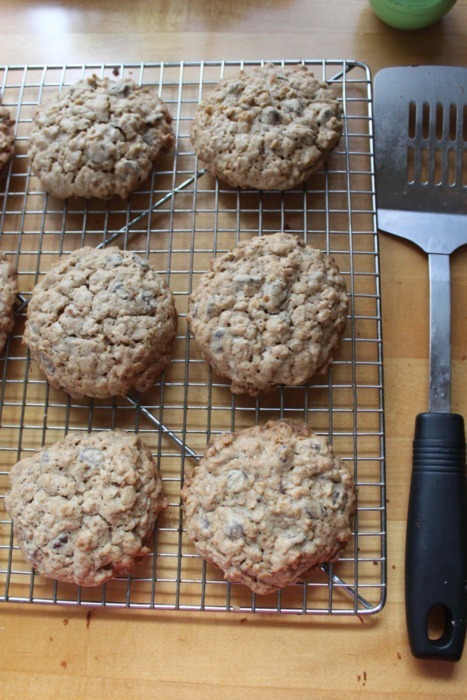 Most baking recipes are forgiving enough that even a 50% substitution of whole wheat for all-purpose can be successful. Like I said before I really really wanted to be making chocolate pudding when I discovered I was out of cornstarch, but I did have everything on hand for these guys. 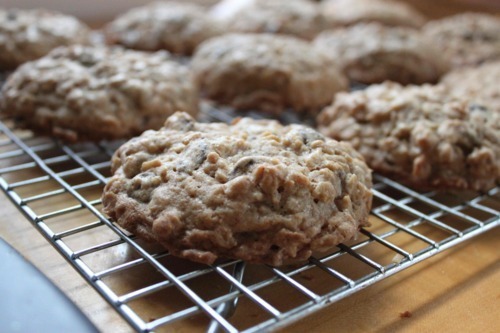 They are my ideal oatmeal cookie - crispy outside, chewy center. And with both oats and whole wheat I won't feel so guilty when I have one (or more) for breakfast. Combine the flours, baking powder, cinnamon and salt. Set aside. In a stand mixer fitted with a paddle attachment or a hand-mixer, cream together the butter and sugars on medium high speed until pale and cream, 3-4 minutes. Add the eggs one at a time on medium speed. Stir in the vanilla bean paste, followed by the flour mixture. Stir in the oats and chocolate chips. Scoop by the quarter cup onto parchment lined half sheet pans, 6 to a pan. Bake for 18-20 minutes until golden brown on the edges. Cool 1 minute on the pan and then remove to a wire rack for cooling.